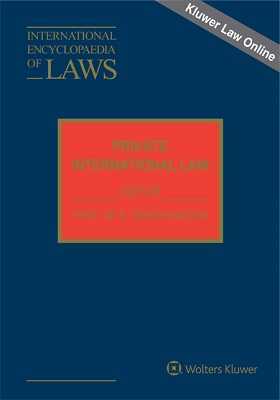 This is the first and only publication to provide comprehensive coverage of national laws on conflict of laws, now more commonly referred to as private international law. It presents country-by-country national monographs dealing with the statutes, regulations and case law each country applies to cases involving transnational issues in, e.g., business, family or inheritance law. It offers every lawyer dealing with questions of conflicts of laws much-needed access to the conflict rules of other countries, presented clearly and concisely by local experts. Beginning with a general introduction to the private international law of the country concerned, each monograph goes on to discuss choice of law technique, sources of private international law, the relevant connection with the law of a country and the connecting factors, the rules of choice of law on natural and legal persons, contractual and non-contractual obligations, movable and immovable property, intangible property rights, company law, family law, marriage, cohabitation, registered partnerships, property, maintenance, child law, and succession law, including testamentary dispositions. Each national monograph concludes with an overview of the country's relevant civil procedure, examining lex fori and issues of national and international jurisdiction, acceptability and enforcement of foreign judgements, and international arbitration. This subset of the International Encyclopaedia of Laws is an excellent guide for lawyers, judges, legal counsel, notaries public, marriage registrars, youth welfare officers, and local public authorities, as well as teachers, students, and legal researchers.